Where does the name ‘Pannill’ emerge from? Those of us blessed with this surname have spent years correcting its spelling and pronunciation. Our name doesn’t compute for most people. That may be because it’s not Anglo-Saxon. The name seems to be Norman French. William the Conqueror landed in England in October 1066 – 946 years ago. Since the chances of our surviving to the thousand-year anniversary of this invasion in 2066 appear remote, let’s commemorate now. The Conqueror spoke French, but he was descended from Vikings. The French called him a Norman, short for Northman, meaning Scandinavian. One of William’s knights at the Battle of Hastings was a William Paganell. A history of the Normans mentions a “William Paganel [the spelling varies] lord of Montiers Hubert which is supposed to have been the original seat of this ancient family . . . .” Ordericus Vitalis, The Ecclesiastical History of England and Normandy, Volume 2, p. 427. You can vacation even now in Normandy at Montiers Hubert. Reaney traces the name from Radulfus Pagenel or Paganellus in the Domesday Book (1086). He traces it from Old French Payenel. The derivation is Latin “paganus,” meaning “rustic” but by medieval times the name meant “heathen” – apparently the man named was not a Christian. Most of the Paganels and Paynells held lands in Yorkshire. 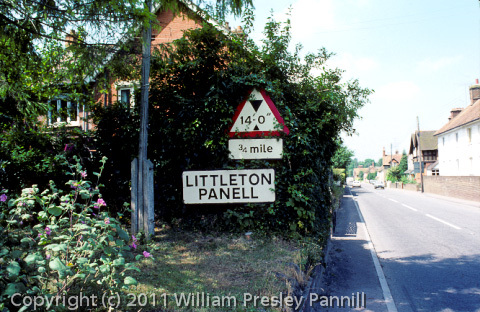 But somehow the name became attached to the southern village of Littleton Panell in Wiltshire. The village appears in the Domesday Book, the Conqueror’s inventory of English lands, in 1086. The settlement contained 25 households. The village still exists, and we stopped there in 1984. 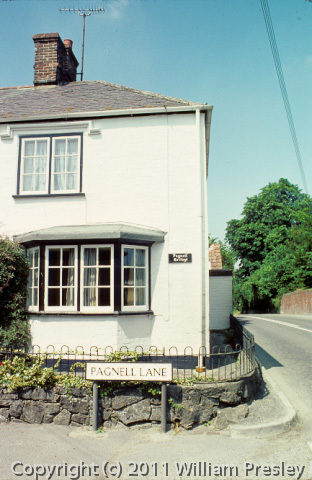 A Pagnell Lane and a Pagnell Cottage remain in today’s Littleton Panell. Sorting through some old slides, I came across these pictures I had taken of the village in 1984. Is the name Pannill, with emphasis on the first syllable, also the name of the village? I walked into the pub in the village and asked the bartender, “How do you say the name of this place?” Littleton PA-nel, he said. Maybe our DNA goes back to this spot. 2 Responses to Where does the name ‘Pannill’ emerge from? My name is Larry Panell. We descend from the Pannells of Virginia and I have spent years trying to complete some type of chart of the family’s lineage. Each time I get foiled because information conflicts or dates and names get crossed. It remains a great hobby and I hope to find more solid evidence at some point but until then I just continue to search.